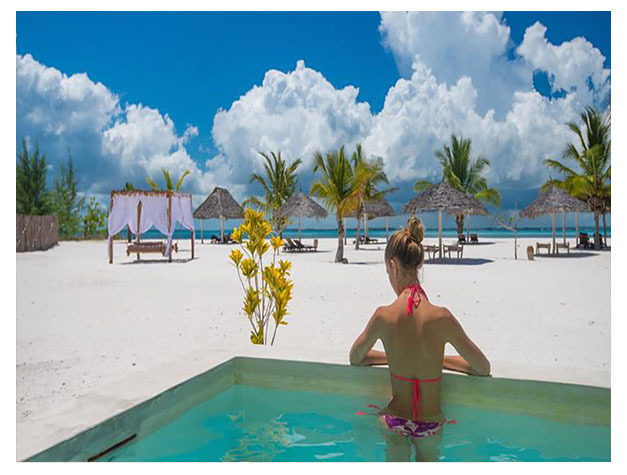 Overlooking Chwaka Bay, Konokono Beach Resort is situated on the South East coast of Zanzibar on the Michamvi Peninsula. It features a private beach, beach bar, massage centre and free Wi-Fi. Each villa is surrounded by lush vegetation and comes with a private plunge pool. It is air-conditioned and is equipped with a flat-screen satellite TV, minibar and tea-and-coffee-making facilities. The bathrooms include free toiletries. The restaurant at Konokono is perched on top of a cliff, offering panoramic views of Michamvi Bay. It serves a combination of local and international dishes and it features an infinity pool. Guests can enjoy long walks on the pristine beach or relax around the swimming pool overlooking the bay. Zanzibar Airport is 60 km from the resort. Stone Town is a 1-hour drive away. Free private parking is available.